Like any key home improvement, a new inground swimming pool can bring years of enjoyment and boost your property’s value and beauty. And like most major home improvements, the construction of a new pool also represents a major financial investment. In developing a project that meets your preferences and complements your outdoor space, a host of variables will influence the final pool cost. Among them are conditions of a home’s outdoor space—not only the specific spot where the pool will go, but conditions around the property. With this in mind, it’s helpful to know a little something about factors that occasionally come into play when constructing a pool. A basic understanding of them—which range from soil conditions to available space for heavy construction equipment to enter—will help you better appreciate the bids you obtain from pool contractors. The good news is this: The vast majority of backyards in most areas are well-suited for putting in a pool and accompanying features like deck and patio areas. More importantly, even if your backyard is less than ideal, a qualified pool builder will be able to address most any typical challenge and do so at a reasonable price. That’s why thousands of pools get built every year in America’s backyards. Let’s take a brief look at three general categories of backyard conditions that sometimes exist, as well as the various design and construction solutions pool builders use to handle them. Once a pool design gets finalized, and construction is ready to begin, the first major phase will be digging a large hole for a new pool. Excavation requires machines like a front-end loader or a track hoe that can dig into the earth and move large amounts of soil. In addition, the smartest excavation strategy involves having a sizeable dump truck near the pool site to receive the displaced backyard dirt and then haul it away. We’re talking heavy machinery here. Big equipment like excavators and dump trucks need space to enter the backyard. By far, the most commonly used entry point for vehicles is a side yard. In some regions of the U.S., in some neighborhoods, the choice is an alley. Occasionally, easy access to the property is available via an empty adjacent lot. The first choice for pool excavation equipment is a large track hoe. It can scoop a lot of dirt at one time and can usually get the job done the quickest. In the majority of cases, this capability makes a track hoe the most cost-effective excavation method. However, this big, heavy apparatus can’t get into every backyard. For example, a side yard gate may not offer a clear path with the needed 8 to 10 feet of width to pass through. Or, existing trees or overhead power lines may impede access. In some cases, a neighbor can help. For example, they may allow a fence to temporarily come down to provide a wider path for machines to enter. To remove a fence and later restore it, a cost will be involved. In yards where entry is inadequate for large equipment and access from an adjacent yard is not available, another digging option is available. A smaller excavator, such as a Bobcat, can be used. Depending on the specific model, they can fit through a path that’s only 4- to 6-foot-wide. However, using a compact digger like a Bobcat has a drawback: smaller buckets that remove smaller amounts of soil with each scoop. As a result, they require more time to dig a pool than does a track hoe. Increased digging time means increased excavation costs. On top of this, a second Bobcat may be needed on site. Its job will be transferring excavated earth out of the yard to a nearby dump truck that has to be positioned outside of the inaccessible yard. Again, there will be a charge for the extra machine and labor. In the rare yard with zero access for even small excavators, a last-resort is available: A “hand dig.” This solution requires a crew of laborers to perform some old-fashioned, manual-style excavation using shovels. Typically, wheelbarrows are used to haul off the soil. A hand dig will increase labor costs—but this approach has proven to be effective for getting the job done. Many backyards are flat or virtually flat, making them ideal for an inground pool. However, some are not. So, yes, another consideration for pool design and construction—and budgeting—is the elevation, or grade, of a backyard. Both terms refer to variances in the upward or downward slope of the ground. Pool builders can address most any grade—steep with hills, or downward slope—with a design and/or with modifications to the dig site that make a pool possible in the location. Budget and style preferences will influence choices about grade changes or design alterations. Let’s say a yard slopes a foot or two. Typically, the most cost-effective approach is to flatten out the ground. An excavator will remove soil from higher areas and grade the earth so the desired pool site becomes level. Additional time to prepare the site as described here this will add to construction costs. Another approach is to leave the elevation as it is, and change the design of the pool. Builders can create a configuration that integrates into a sloped site—and even complements it. The result: one end of the inground pool will be flush with the ground, like a typical inground pool; the other end might rise out of the ground a foot or two. Such a design boasts a distinctive appearance. The exposed, “above-the-ground” portion of the pool wall provides decorative opportunities for covering the exterior with beautiful stone or tile. Along with these extra amounts of decorative materials, the project will require additional structural materials. Concrete (gunite or shotcrete), which forms the pool shell, will be needed for this exposed portion. The extra material and labor needs get calculated into the budget. If the preference is to maintain the yard’s varied elevation, then a smart way to go is incorporating raised bond beams—a section of the pool wall that rises above the ground—into the pool design. This approach works well with a pool built adjacent to a major slope in a yard. Raised bond beam can be functional, such as keeping loose soil from a slope above from sliding into the pool. A bold, raised wall that’s integrated into the pool structure can also be an eye-pleasing addition. For example, it can include decorative features such as cascade water features and additional sections and patterns of tile or stone. By boosting the budget, backyard slopes can provide other creative avenues. In some cases, a slope can serve as a foundation for a large, dramatic rock waterfall. With a slope or pool that’s positioned on a canyon rim with a great view, comes a superb opportunity for a stunning infinity-edge pool. In some areas of the country, in certain neighborhoods, pool builders expect high odds for challenges that lie underground. For example, they may know to expect rocky soil that will require special excavation steps. Or, upon entering a backyard that’s adjacent to a particular lake, they can count on having unstable soil. While builders can anticipate some obstacles, some they cannot. It’s not possible to know every hurdle lurking in the earth. What is known: While pool builders can almost always overcome underground challenges, doing so will increase construction costs. Here are some of the more typical ones that fit the bill. Everyone wants water in their pool, but not while it’s still under construction. However, water may seep into the dig site at several points during construction. The first point is immediately upon the initial dig. 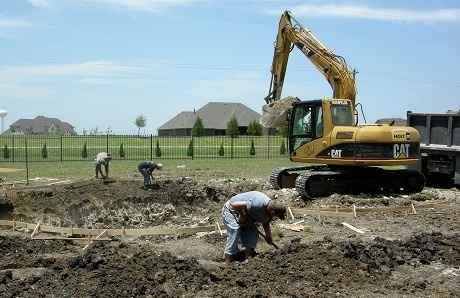 If water shows up as soon as the first dirt is shoveled, a pool builder may need to help dry out the ground before any excavation can continue. To do so, crews may install temporary pipes and a pump around the pool site to draw water out of the ground for a few days. The second scenario is a slow water infiltration: After the initial dig, water fills the excavated hole overnight. In this case, a pool builder will install a pump and lay a bed of gravel (which directs underground water flow) into the bottom of the hole. The pump will run daily inside the excavated hole to keep water at bay during other construction phases. The third scenario involves groundwater that keeps coming up—no matter how fast a contractor digs. This kind of unwanted flow may call for a series of pumps; a builder will set up several around the exterior of pool hole, with several more inside. While the construction crew continues their work, the pumps extract water. Part of the solution here may also entail laying a bed of a rock gravel and bringing in bigger rocks to “pack the hole” during the excavation. As long as the rocks are heavier than the water that’s being forced up, the rocks win! Certain types of soil can make pool construction more challenging. Soil that has a tendency to shift—versus remaining stable—requires special attention. Expansive soil and collapsible soil are at the top of the watch list. Expansive soil, such as clay, easily traps moisture. Like a sponge, it gets larger as it takes on water, and contracts when it dries out. Now, most soil is subject to these dynamics to some degree. However, some forms are particularly expansive. Because this soil expands and contracts more dramatically, the pool’s structure will need to accommodate the shifts. With their steel and concrete shells, concrete pools are extremely durable. However, when pools are built in expansive soil, their shells may experience extra pressure caused by shifting earth. Therefore, professional contractors will bolster the pool shell throughout the floor and walls with additional material; they may increase the amount of concrete, as well as the reinforcing steel bars. Naturally, the added material will add to the pool budget. The other soil that warrants special care is what’s known as collapsible soil. Sandy soil is an example. It can shift with only a minimal amount of moisture or pressure. With this type of soil, the integrity of an excavated pool hole is vulnerable to the elements. For example, wind or rain can cause the sides (interior walls) of the hole to break off and cave in, clogging up the freshly dug site. When builders recognize the soil as collapsible, they can take preventative measure. One approach is to reinforce the pool hole as they dig it. They frame the hole with wood two-by-fours and sheets of plywood. Doing so creates a temporary frame to hold the soil in place while they continue removing soil. This precautionary step may slightly affect excavation costs. However, it can save money by preventing a cave-in—a total collapse of the pool hole. When that happens, a builder must to re-start the entire excavation process with added expense to the client. Rock is never welcome during pool construction, but occasionally it is present. In a few regions of the U.S., rock is somewhat common and pool builders know to prepare for it. When excavation equipment encounters rocks in the ground—especially when it comes as a surprise— the pool budget gets hit, too. In some backyards, the problem may be limited to a few individual stones that the excavator machine can carefully remove. However, in a yard where crews hit a rock bed, the job is much tougher. Some excavators can be fitted with a jackhammer attachment that will break up rock. Doing so will take additional time and excavation costs will go up as a result. In severe cases of rock, other more sophisticated—and costly—forms of removal may be needed. Some backyards have underground utility lines. They vary by region and neighborhood, and they can include water, gas, electric, sewage, septic, cable, and phone. Before pool construction plans are finalized, builders try to locate underground utilities that could pose problems. Builders utilize specialty utility-identification companies. These firms maintain records from various utility companies showing locations of lines. Even with data from these experts, now and then, builders will come into contact with an unmarked line. Unmapped utility lines are a reality, especially in older neighborhoods with spotty historical records from utility companies. When utility lines are identified ahead of excavation, a pool builder may see that one lies in the path of the planned pool. At that point, the builder will provide options. In some cases, a utility line can be moved for a reasonable cost. Or, a better solution may be a minor repositioning of the pool’s location within the immediately planned site. A reposition may have zero or minimal cost impact. In other cases, the pool’s entire location within a yard may need to change. Depending on the yard, the original construction budget may not change much at all, or change significantly. Building a new backyard retreat requires a major construction effort, and certain outdoor conditions around the pool site can sometimes affect the final price tag. However, most residential yards have no obstacles or only minor ones affecting pool construction. Exceptions do occur in certain individual U.S. markets due to local topography and geological conditions. Of these, most are easily addressed, and builders can usually provide a reasonably priced solution. At the end of the day, the vast majority of pool buyers can have the aquatic retreat they want and for which they budgeted. You can be one of them! 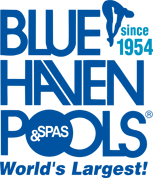 To learn more about a new pool and how a design will work in your backyard, contact your local Blue Haven Pools office.